Choreography Intensive is a one-of-a-kind, two-week program designed to give aspiring Musical Theatre choreographers (ages 18-29), unparalleled access to training from Broadway professionals. Week 1 will be focus on Techniques, Principles, Lectures, Talkbacks, and Styles classes. 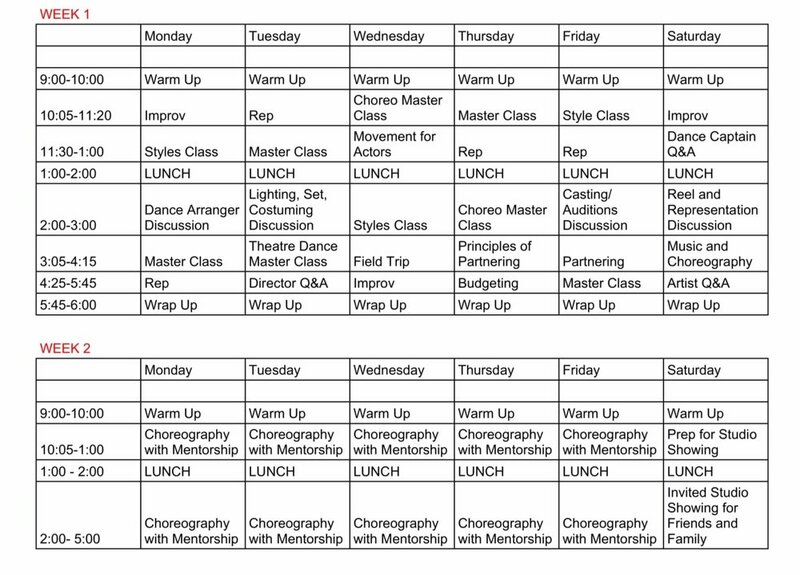 Week 2 will give students the chance to apply what they learned in Week 1 and be mentored in the creation of dance. Participants may also attend The New York Public Library, a Broadway show, receive backstage tours, and more! Enrollment is limited, allowing for individualized training and feedback. The Intensive will culminate with a private studio showing of the work created during the intensive. All classes will take place the heart of downtown Manhattan. Food and housing are not provided. Some financial aid is available for admitted students. Once admitted to the program, if a student wishes to apply for financial assistance, they are invited to submit a letter explaining their financial situation to edu@dancelabny.org. Financial aid awards are based on both need and merit. Please note that most scholarship awards cover only a portion of tuition. In cases of extreme need, full tuition may be awarded. Christopher Gattelli (My Fair Lady, Spongebob), JoAnn M. Hunter (School of Rock), Marc Bruni (Director, Beautiful), Timothy Edwards, Camille A. Brown, Jason Styres (Casting), David Dabbon (Dance Arranger, Beetlejuice), Karla Garcia (Wicked, Hamilton), Burke Brown (Lighting Designer La Scala), Jeff Calhoun (Director/Choreographer, Newsies), Donyale Werle (Set Designer, Peter And The Starcatcher), Brooke Wendle (“America’s Got Talent”), Alicia Albright (Frozen), Lucille DiCampli (Agent), Ali Solomon (Charlie And The Chocolate Factory), Wendy Seyb (PeeWee Herman Show), Al Blackstone (“SYTYCD”), Nancy Lemenager (Movin’ Out, Chicago), Mark Stuart and Jaime Verazin (Bandstand), Ray Mercer (Lion King), Kristen Carcone (Then She Fell), Ricky Tripp (In The Heights, Hamilton), and Artistic Director Josh Prince (Beautiful, Shrek).